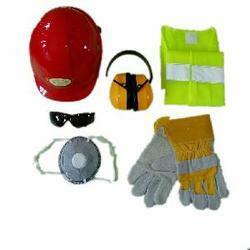 Manufacturer and Supplier of PPE Safety Accessories. Our product range also comprises of Sewage Treatment Plants, Air Pollution Control Devices and Industrial Chemicals. Having a definite quality management system, we are regarded as the noteworthy manufacturer and supplier of supreme grade PPE Safety Accessories. The offered accessories is designed for safety of body from heat, fire, sharp objects, chemicals, etc. Our offered accessories is used by person who works in harsh and extreme climatic condition. Moreover, it is checked for its quality on different stages of quality parameters before being supplied to our clients. Looking for “PPE Safety Accessories”?